It will come as no surprise to hear that the mobile device is fast becoming the priority channel in the digital marketing mix. According to ZenithOptimedia, 2016 will see global mobile ad spend overtake newspaper ad spend, and is on course to outstrip desktop as soon as 2018. Smartphone or tablet, these devices and their always on users will increasingly dominate the minds of marketers over the coming years. 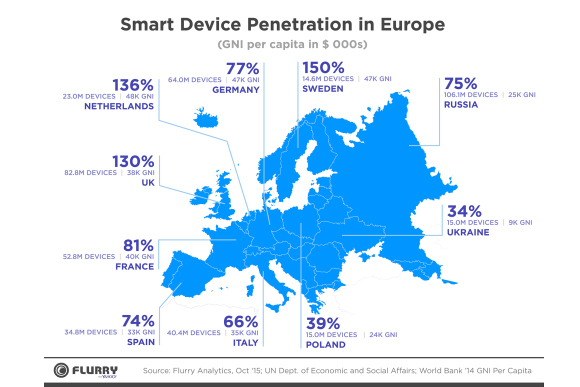 New research from Yahoo’s Flurry shows how device usage and preferences can vary dramatically by region, even within Europe. Our mobile app report, which draws on data from 564 million iOS and Android devices across the ten largest European countries by population, provides a comprehensive and illuminating picture of smart device use. The top three countries for smart device penetration stand head and shoulders above the rest. The UK comes in third, with 130% penetration, behind the Netherlands (136%) and Sweden (150%); all are far ahead of fourth place Spain at 81%. These staggering rates of adoption actually mean these countries boast more smart devices than citizens, as households typically have multiple devices including tablets and phones. With mobile devices now the preferred channel for online browsing, marketers must ensure all content is – at the very least – mobile-optimised, and should look to mobile native advertising to deliver less disruptive, more engaging content to consumers. If we look at the time spent on our smart devices, 90% is now in app as opposed to mobile web. The total number of sessions is growing too, underlining the sizeable marketing opportunity apps bring, with a 36% growth in the UK between October 2014 and October 2015. It appears that UK consumers are prioritising staying in touch, as messaging and social apps take up 41% of our total app time – almost twice as much time as gaming, and four times as much as music, media, and entertainment apps. Effective campaigns must prioritise both content and delivery. Native advertising allows marketers to communicate their messages in a more natural way, and according to Yahoo research, smartphone users are twice as likely as other consumers not to care if the content they read is an advert, provided it’s engaging and well targeted. Demanding a seamless, rich, multimedia experience wherever they are, smart device users have pushed marketers to deliver higher quality content than ever before, to the right person, at the right time, on any device. Native advertising can provide exactly these in-stream content experiences, at scale and across any devices. We live in an omnichannel world, but mobile – and particularly apps – should be topping the list of marketers’ priority channels for 2016 and beyond, supported by a native strategy.